With mouse cursor on "download " link press Right mouse button once. You will see this menu --------------- >. 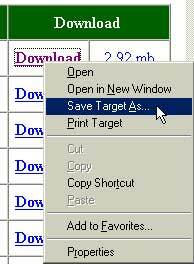 select "Save Target As..." Option. You will see following dialogue box popup. Choose the desired directory and press save button.